Down is a natural matter, used since time immemorial to keep warm.. It is a body produced by the skin of water birds, on the belly and under the wings, to protect the vital parts during their migratory journeys. The down is made of long and fine barbs called barbules and contrary to the feather, has no shaft. Its origine is the same as the scales of reptiles, the ancestors of birds. 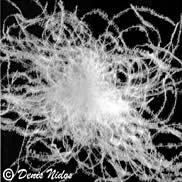 As for wool and hair, the α and β keratins help the down to resist physical and chemical agents. This explains its longevity. Retaining the air in its multiple filaments, the down is an excellent heat insulator, all the more effective since it favours the circulation of steam. Our experience guarantees to preserve the natural properties of the down (volume, impermeability and durability), without addition of useless chemicals and in the respect of the required hygiene standards. The soft treatment confers our “000” sleeping bag a higher than the average aptitude to evacuate humidity, and our total quality control guarantees to you a 800 CUIN * (cubic inches) minimum down sleeping bag , without additives. * CUIN: unit used in the international down used in high mountain equipment tests. .